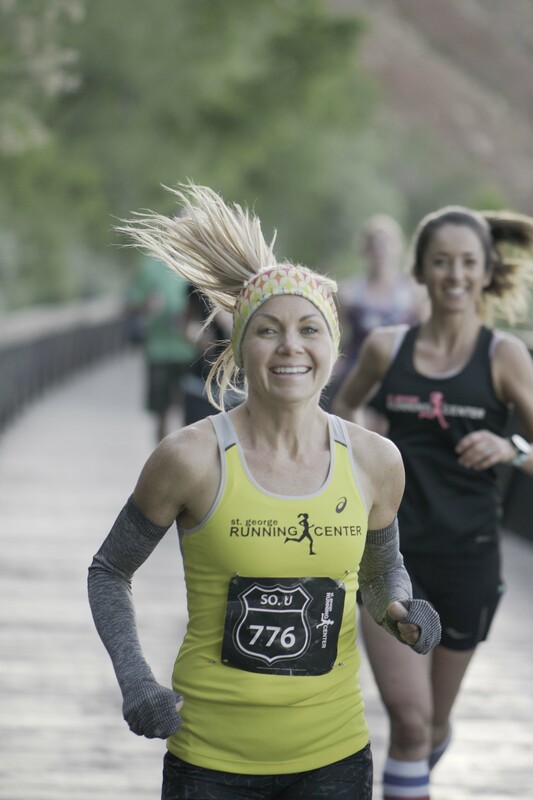 Brief Description: The Southern Utah Half Marathon is a beautiful route starting at Highland Park in Washington,UT offering amazing views of the sun rising over Zions National Park in the distance. The race will proceed quickly downhill through City of Washington to the scenic Virgin River Trail. This paved trail offers a gradual decline grade for the remaining 9 miles of the race. Starting Line: The starting line will be at the top of Highland Pkwy, about 200 yards above the homes on Crown King Ave. There will also be porta potties and pre-race refreshments staged in the parking area on the North end of the park. Race participants will be bused from the finish line at Bloomington Park, St. George to the starting line at Highland Park, Washington . Bus drop off and turn around will take place where Highland Pkwy meets Crown King Ave right next to the lower parking area at Highland Park. FINISH LINE: The race will finish at the Bloomington Park in St. George. As runners come across the Man of War bridge they will take an immediate left onto the dirt, run around the outside of the ball fields and will end on the grass next to the ball fields. There will be an aid station and runner finish area next to the finish line with refreshments and bathrooms. An Awards Ceremony will be held at 9:45 AM. AID STATIONS: Aid stations at miles: 2.25, 4, 6, 8.5, 10.5, 11.75. Each aid station will provide the runners with water and Gatorade. Aid Stations 6 & 10.5 will also offer GU. Aid Stations 4, 6 and 10.5 will also have porta potties. PARKING: Parking will be available at the Bloomington Park and Bloomington Elementary School. No Parking on Man of War rd. BUS TRANSPORTATION: Buses will leave to take runners from Bloomington Park between 5:45am and 6:10am to take you to the start line at Highland Park in Washington. All runners must ride the buses to the start line. Top 5 men and women awards and gift cards to the St. George Running Center. Competitive Walking Division: The 2019 Southern Utah Half Marathon will be offering a competitive walking division! We hope you are as exited as we are. For additional info on race walking and power walking, please click here or here to learn more. Volunteers will be on the course watching the participants entered into the walking category to make sure they are actually walking and not running. Please follow the honor system, if you are caught you will be disqualified. Please note that there will be a 4 -hour time limit for all division’s including the walking division which is an 18:19 per/mile pace. Awards will be given to the 1-3 Male and Female finishers in this category. If you enter this category you will not be qualified to win an any age division awards.